Moving-coil cartridges are wonderful things, but they suffer from a disadvantage in their extremely low output, often less than 1mV peak, or one two-thousandth of what most CD players produce. Clearly, low-noise amplification is a must. Because they have a low impedance, the self-noise of such cartridges is actually very low, but getting an amplifier to match or (ideally) better it is hard work. It can be done with transistors or valves if you use enough of them, but it can often be more practical to use a transformer to provide some initial gain before active devices are called into play. A transformer, being passive, provides no power gain, but it can step up voltage (reducing current inversely) by enough to make low-noise active amplification much more efficient. As a maker of cartridges, Audio Technica is well aware of the challenges and has designed the AT2000T transformer to step up the output of typical low-output moving coil designs. Unlike some 'universal' transformers, it has no impedance selection, just a single input and output per channel, but it is claimed to match cartridges with impedance between two and 17 ohms, which in practice means the vast majority available on the market. Its voltage gain of 24dB will boost the level sufficiently to feed a standard moving-magnet input. The transformers inside the case are small, under 40mm each way (actually by the standards of MC transformers that's quite big!) but the case is this size for a reason. Small-signal transformers are made of materials that are sensitive to mechanical shock and their electrical performance can be permanently affected by dropping them. They can also be mildly microphonic. AT has taken the unusual step of fixing these transformers by surrounding them with soft plastic foam: no screws or other metal fasteners are used. Around that is the case made of a high-permeability grade of magnetic material that provides effective magnetic screening – though you're still advised to keep the unit away from mains transformers and anything else that might generate hum fields. We happened to have an aged, but honest AT cartridge on hand, plus models from Denon, Goldring and Ortofon, plus various phono stages too, so we were able to try this transformer under a range of conditions. 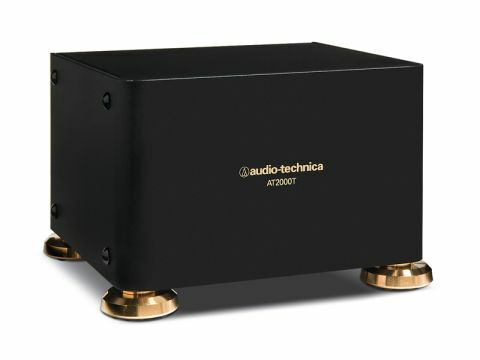 It's impressively capable, and we mean it as a compliment that we were never really aware of its presence, except in one very valuable respect: it really does reduce the noise compared with even the best phono stages we could lay our hands on. Transformers are not strictly noise-free because they have stray resistance and other factors which limit their performance, but this one approaches the ideal very closely. As a result, it gets the most out of high-quality cartridges, making the replay system quieter than even the run-in groove on most LP pressings. The net difference while music plays may only be a couple of dB of signal-to-noise ratio gained, but subjectively that's well worthwhile in terms of extra resolution, veils lifted and so on. Our Ortofon MC2000 (an oldie, but a goodie) sounds perhaps clearer than we've ever heard it, producing images of real solidity and stability, with a much better-defined acoustic around the performers than all-active amplification produced. Transformers are sometimes accused of compromising the frequency extremes, but even with slightly mismatched cartridges (impedance over 20 ohms) we couldn't hear any such effect. Indeed, the unusually low noise makes the bass even clearer than ever, with a shade more weight to it but immaculate control and precision (the treble is very sweetly extended and open). There's no hint of coloration in the midrange: as with bass, the AT2000 makes things even purer here, simply because one's ear isn't trying to filter out quite so much noise and hash. In the lab, we found bandwidth is superb and dead flat across the audio band plus, at least, an octave each end, while distortion is low at both high-and low-signal levels.